Fibromyalgia Causes: What Causes Fibromyalgia? It is not clear what the fibromyalgia causes actually are. If you are asking yourselves the question what causes fibromyalgia, we do not have an answer for you today. However, there are plenty of factors with extremely high probability of being involved in the development of this chronic disease. Here follow some of the most common causes of fibromyalgia. The most widespread theory regarding fibromyalgia causes is that people developed changes in transferring messages to the brain. These abnormalities are seen in the way the central nervous system transfers the pain messages from the entire body. The reason for these abnormalities may be a result of chemicals change in the nervous system of the patient. The brain, nerves and spinal cord are all parts of the central nervous system. The main function of this system is to transmit the information to the body with the help of some specialized cells. If changes in this system are identified, this may actually explain the extreme sensitivity to pain, being the main symptom of fibromyalgia. 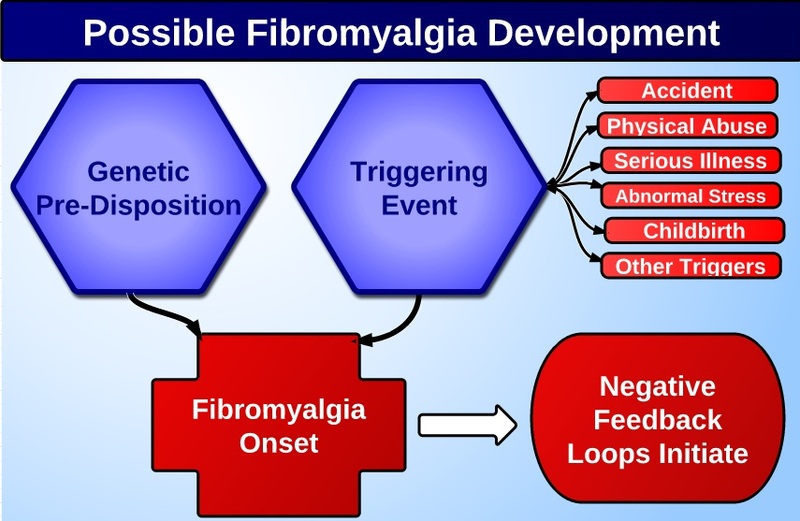 Many research theories point out to chemical imbalance in patients diagnosed with fibromyalgia. According to their findings, these people have low levels of serotonin, dopamine and noradrenalin in the brain. The functioning of these hormones is of huge importance for the human body and it is no wonder why abnormal levels are considered to be some of the fibromyalgia causes. In general, these hormones are regulating the mood, sleep, appetite, human behavior and responses to certain situations. Additionally, they play a big role in sending pain messages to the brain. Their job is to process them after they are being sent by the nerves. Some clinical trials have showed that increasing hormone levels in the brain with the help of medicine can actually disrupt these signals. Also, suggestions have been made that by changing the levels of other hormones like cortisol, you may cause or contribute to fibromyalgia. Disturbed sleep and insomnia are commonly listed as symptoms of fibromyalgia, but they can actually also be its cause. The truth is, fibromyalgia can really prevent people from sleeping well and even cause extreme tiredness. However, sleeping badly can also be the cause of fibromyalgia. People diagnosed with fibromyalgia often sleep badly. When this happens, their pain levels are increased, which is a proof that this is not only a symptom, but a cause too. Genetics are known to play a minor part in developing fibromyalgia. The idea here is that some people are more prone to developing this chronic condition than other, based on genetics. So, if you are having someone in the family diagnosed with fibromyalgia, there is a slightly increased risk of developing this condition yourself. This is not yet confirmed, but if this is true, genetics are a great way to explain why there are triggers that cause fibromyalgia. This condition occurs when the joints are somehow damage, which causes stiffness and pain in the muscles. Ankylosing spondylitis can be manifested with swelling and pain in the spine. When a fibromyalgia diagnosis is set, the doctors usually test patients for these conditions too. Candida albican or yeast overgrowth is a condition that causes very similar symptoms to those of fibromyalgia. These symptoms include difficulty concentrating, joint pain, muscle pain, chronic fatigue, insomnia, bowel dysfunction, neurological disorders etc. Additionally, yeast may also be the cause of fibromyalgia. It is theorized that patients with fibromyalgia have some genetic defect. This defect prevent the kidneys from excreting phosphates and as they build up, the body starts storing them. They are usually stored in the bones, tendons, muscles and ligaments. After being stored there, the phosphates remain in the cells and reduce their ability to produce energy. This is what eventually causes the spasms in the muscles. It is not quite understood how they can be the cause of fibromyalgia, but when people eliminate all excitotoxins from their diet, they are known to find relief from the fibromyalgia symptoms. When the body starts the detoxification process, the symptoms may initially worsen. However, this method often relives people from their chronic pain. Excitotoxins are used in almost every processed food you consume. These include aspartame or NutraSweet, monosodium glutamate or Accent and hydrolyzed protein. They are called excitotoxins because of their action of exiting the brain neurons. When they do this, the neurons fire rapidly and eventually this may lead to them dying. When a neuron dies, it never regroups. Too much acidity is known to be one of the causes of fibromyalgia, alongside with dysoxygenosis and oxidosis. The first one is abnormal metabolism of oxygen, while the latter is too much oxidation. A study in 1997 has actually shown that the oxidative damage in people diagnosed with Fibromyalgia may be the cause. It was published by the Journal of Musculoskeletal Pain. The majority of patients diagnosed with fibromyalgia have deficiency in magnesium. This is the mineral that works by relaxing the muscles. That’s exactly why magnesium is also included in the fibromyalgia treatments. Most researchers consider the immune system to be the main cause of fibromyalgia. The role of the mutated bacteria and viruses called mycoplasmas are now known to be a possible cause of fibromyalgia. Even though exercise can be painful, especially in the case of fibromyalgia, but after a while this becomes a good thing. At the beginning of the diagnosis, exercise may actually be the fibromyalgia trigger. There are several clinical studies that have informed of irregularities and damage in the red blood cells in patients diagnosed with this condition. When the red blood cells are damage, this can cause blood flow blockage. Blockage means that the blood cannot flow through the capillaries as it is supposed to, which in turn may result in insufficient amounts of oxygen being transferred to the tissues and muscles. Hence goes the fatigue and pain of fibromyalgia. Hypothalamitis is the over-activation of the hypothalamus gland in the brain. This gland is located in the mid-brain, which is the part that controls the body organs. It does so through the endocrine system, by influencing both the immune and the sympathetic nervous system. The hypothalamus in normal levels should control sleep cycle, circulation, energy levels, muscular function and infection defense. When it is over-activated, fibromyalgia occurs. This is also not something that is proven, but there are many patients that have suffered from neck injuries and developed fibromyalgia later. However, neck injuries may not be the fibromyalgia cause, but its trigger too. There is no research that clearly points in this direction, but there is certainly some connection with hormones and fibromyalgia. Many patients, especially women are diagnosed with hormones instability aside from the fibromyalgia. These imbalances are often found in patients diagnosed with fibromyalgia. Aside from the abovementioned causes, there are many things that often trigger this condition in patients. The flares of this condition are most commonly triggered by changes in weather. When the barometric pressure changes, many of the fibromyalgia patients experience worsened symptoms. Additionally, this is often the first cause for the development of fibromyalgia. Stress is an important cause of fibromyalgia. Aside from being a trigger of its symptoms, it can actually be what causes the first symptom too. When it comes to fibromyalgia triggers, stress is very dangerous. It comes suddenly and in waves and there is rarely something we can do about it. What follows is increased or new pain in joints and muscles. As with the case of neck injuries, other injuries may also trigger the fibromyalgia onset. Being properly rested is important, but can be quite challenging in cases of fibromyalgia. When the sleep is disrupted for some reason and this lasts for a certain period, this may trigger the onset of fibromyalgia. This is why it is highly important that you find a good sleep routine and follow it every day. Travelling is not easy for people with fibromyalgia, so it is no wonder that many people are actually first hit by this condition why flying or riding to a certain place, especially if they do this often. When one travels often, they are exposed to all kinds of changes, including stress, temperature changes and sleep routines disruptions. People can be triggered by various things, including certain sensitivities. People with fibromyalgia can react to light, noise, allergies and even smell. Being exposed to these things they are sensitive to may not only trigger symptoms of an existing fibromyalgia, but may also be the main trigger that causes fibromyalgia in the first place. The underlying fibromyalgia cause is still somewhat of a mystery, but there are plenty of researchers that still seek for a way to understand what is the main trigger of this condition. However, the majority of researchers agree that there is something to do with the neurotransmitter dysregulation and the central processing with neuroendocrine. Of course, there are those studies that point out to genetics, but the majority of patients are actually known to be triggered by certain trauma to the body, mostly got by injuries or other illnesses. The researchers are improving daily and an exciting research is currently existing in the areas of neurosurgery and brain imaging. This researched is aimed to test whether fibromyalgia is actually caused by a defect with interpretation in the central nervous system. The hypothesis here is that this defect leads to the most common fibromyalgia symptom – the abnormal perception of pain. Even though there are research results that are almost undeniable, there is much more to discover in the field of fibromyalgia causes. Researchers work daily to uncover the true reason why this condition is developing in patients.